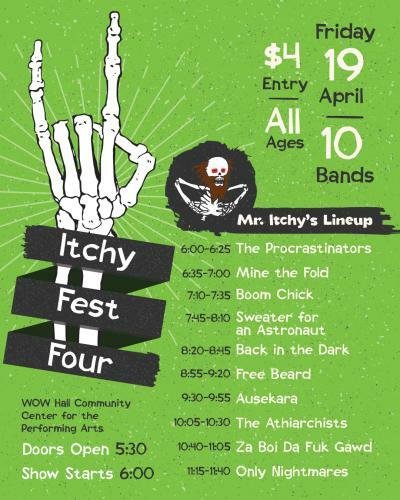 On Friday, April 19, the Community Center for the Performing Arts proudly hosts the 4th Annual Itchy Fest Presented by Itchy Ribs and featuring The Athiarchists plus special guests The Procrastinators, Mine the Fold, Boom Chick, Sweater for an Astronaut, Back in the Dark, Free Beard, Ausekara, Za Boi Da Fuk Gawd and Only Nightmares. Drummer Dano and guitarist/vocalist Aaron Tunnell are the two-piece madness that is The Athiarchists. The band formed on April 20, 2006, and became popular locally with their DIY attitude, exposure on KFLY Radio, and the release of their raw tour footage known as “Athiarchist TV”. Even more of a buzz got started when they began randomly showing up at major festivals and raging it in the parking lot in their homemade mobile stage. The Music Adventure Stage is an overhauled U-haul with a 12,500-watt generator, full PA, stage lighting, gear storage and sleeping bunks. They played the parking lot at events such as the Van’s Warped Tour, Jagermeister Music Tour, and three years of Rockstar Mayhem tours before finally getting official permission to play the entire tour -- after staunch support from the other bands and people with shirts and picket signs that read, “I support the Athiarchists – Let Them Play!” Their sound is a violent blend of Punk, Metal, and a new breed of Thrash; their music itself defies definition. The energy and passion released from this twosome has made them one of the most sought after bands in North America. Itchy Ribs is a recreational marijuana joint company; they have been putting on Itchy Fest around 4/20 and this will be the fourth year. It has never been on 4/20, usually always a day or two after. This will be the second consecutive year at the WOW Hall.